Lock in a great price for Grecotel-LUXME Daphnila Bay Dassia – rated 8.9 by recent guests! The food & service in the restaurants were of a very high standard. We were treated to some beautiful meals. the hotel itself is amazing. the staff friendly and will assist in evrything they can, very kind and welcoming. the foid is deliouciusa and alot of variety. the room where we stayed had an amazing view and although alot if people staying in the hotel its not crowded. We had the all inclusive which was quite good. Food was good and had good variety, alcohol was all top brands. Rooms were nice and spacious. Evening entertainment was pretty good as well, kids seem to enjoy the evening beach entertainment as well. Bar and restaurant staff were excellent and took very well care of us. We booked this hotel as we always wanted to visit Greece. It was definitely good choice. We stayed for 4 nights which was perfect break for our family with 2 young kids. You don’t need to go out of complex because everything is there. All inclusive is great value for money, and food is delicious. All drinks after branded so no nasty headache in the morning. Staff is lovely and helpful. We will definitely return one year. The facilities were first rate with a choice of 6 restaurants in 3 hotels. Staff were friendly and super helpful. Every whim was catered for. Excellent shuttle to private beach and neighboring hotels.Main hotel rooms had noise from the pool area cabaret in the evening but all finished between 11 and 12. Would visit again like a shot. Service was excellent along with welcome. A lot of renovation was recently completed so was pleasantly surprised with everything overall inc food, drink and appearance of the buildings exceeded my expectation (2017 pics are out of date - hotel pictures are accurate). WiFi everywhere, staff to look after children all day and the singers at night were so good I’d pay to hear them (except one who Should pay me!!!) for people complaining about hill it’s really a non issue there’s a shuttle and you’ll need the excercise anyway. The staff was fantastic, I can't say enough about how great they were! The resort is very nice, with great pool, beach, and bar areas outside. The bed was really really comfortable and the room was huge with a great bathroom area. The food was fantastic and the drinks were great as well. Had a really lovely time! Private natural beach. Pool you can swim lengths in. View from balcony that didn't look in to any other rooms. Natural surroundings ... not manicured. Friendly atmosphere. All inclusive is great value for money. Loved playing on the tennis courts but must book in advance. Most staff were generally welcoming and helpful. This hotel certainly justifies its 5 star plus rating given its beautiful location, private beaches, really excellent restaurants, immaculate and helpful staff and grandeur of the main building. The best rooms have their own swimming pools and uninterrupted views over the bay, but are very expensive. The level of service throughout was excellent and we certainly enjoyed our stay. Grecotel-LUXME Daphnila Bay Dassia This rating is a reflection of how the property compares to the industry standard when it comes to price, facilities and services available. It's based on a self-evaluation by the property. Use this rating to help choose your stay! 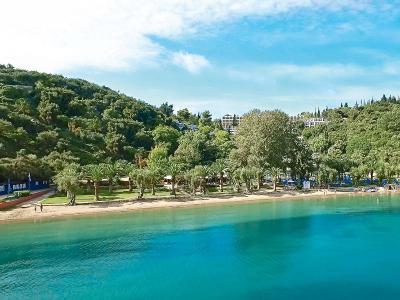 Featuring 2 freshwater pools and a children's pool amid its blossomed gardens, the Grecotel Daphnila Bay literally tumbles down the green hillside overlooking Dassia Bay in Corfu. A variety of activities and facilities, such as children and teenagers’ clubs, fitness and spa facilities, are offered on site. All well appointed guestrooms feature a balcony or terrace, and satellite TV. Rooms are overlooking the gardens and Ionian Sea, while bungalows are hidden among the olive trees. The private, private bathrooms come with shower or bathtub, hairdryer and free toiletries. Greek and international flavors can be enjoyed at the Marco Polo restaurant for lunch or dinner, while homemade pizza and fresh pasta is served at the Giardino di Mama beachside restaurant. Guests can also relax and enjoy a refreshing drink at the Waterfall poolside bar or at the elegantly decorated lobby area. A selection of rejuvenating treatments are provided at the on-site spa center featuring an indoor pool, a hot tub, sauna and steam rooms. Guests who want to stay fit can also use the fitness facilities available on site. The center of Dassia lies within 1.6 mi from Grecotel Daphila Bay, while the scenic Corfu Town is 8.1 mi away. Corfu International Airport is at a distance of 8.7 mi away. Hotel services include a 24-hour front desk and extensive concierge services. When would you like to stay at Grecotel-LUXME Daphnila Bay Dassia? Well-appointed rooms in the main building decorated in bright colors and bamboo furniture. They feature twin beds, 1 sofa-bed and en-suite private bathroom. They include delightful little touches, like roomy rattan armchairs and wrought-iron floor lamps. Well-appointed rooms in the main building decorated in bright colors and bamboo furniture. They feature twin beds, one sofa-bed and en-suite private bathroom. They include delightful little touches, like roomy rattan armchairs and wrought-iron floor lamps, and enjoy Ionian-Sea views. Spacious airy rooms surrounded by mature gardens and lush vegetation. They are decorated in Ionian style with local stone floors, natural fabrics, and wooden and stone furnishings. They feature 1 double or twin beds, 1 sofa-bed and en-suite private bathroom. Spacious bungalow surrounded by mature gardens and lush vegetation. They are elegantly decorated local stone floors, natural fabrics, and wooden and stone furnishings. This room can accommodate 2 adults and 2 children up to 12 years old. House Rules Grecotel-LUXME Daphnila Bay Dassia takes special requests – add in the next step! Grecotel-LUXME Daphnila Bay Dassia accepts these cards and reserves the right to temporarily hold an amount prior to arrival. Please note that Wi-Fi is only available in the lobby. Great place, excellent service, good food, beautiful beach and nice area. There must have some plumbing issues in the property as sewerage smell was quite strong in various locations around the resort. no many places around the hotel that are in a walk distance. if you are planning to do something other then staying in better to rent a car. Poor quality of food and other devices embedded in the full board concept. You end up paying for those who consume vast quantities of mediocre meals and alcohol. We had paid for a "sea" view room, but this was a "tree" view, and right above restaurant which was noisy in the morning with chairs shuffling around - don't get on the second floor. The biggest complain I would have was the large roach like critters running through the hallways in the evening. We flushed a few down the toilet. Access to the other 2 resorts was great, nicer pools and facilities. We are not big drinkers or eaters so the cost was a little less value for us but it’s a minor point, quality alcohol is served. The room we initially checked into ended up having the shower run all the way across the floor and soak anything we had sitting on the floor. The staff eventually upgraded our room, but the first room wasn't great. There are also some unfinished details, like wires that are showing in the rooms and just hadn't been finished off very nicely. Restaurant gets busy at night. Food tended to be a little repetitive. If you wanted the yummy stuff you had to arrive early as it tended not to be replenished. Sadly, although we arrived the first week of the season, the Taverna on the beach was only open on the last two nights of our stay and one had to book several days in advance. We were not made aware of this. The Asian restaurant was also closed. Don't understand why the hotel begins a season when some things are not up and running. We were not made aware of these things. The lodges with cheaper accommodation are quite a long walk from the central building with its marble halls, and have either a small balcony or sunloungers on the lawn outside (but not both). The rooms in the lodges are large and comfortable with beautiful views over the bay but are very plain “cream and brown” in appearance.